Auto Shrink Sleeving Machine (Sleeve Equipment & Label Inserting machine)(ESM-600P) - Chau-Fu Plastics Co., Ltd.
For labeling empty & round bottles of food & beverages (soda, mineral water, dairy products, juice, edible oil, seasoning, etc. ), cleansers and detergents, and industrial products. 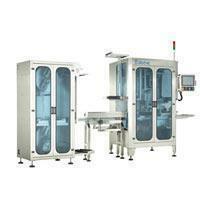 • Available for shrink films over 60m. • Equipped with static electricity eliminator. • Separate feeding PLC controlling system. • The machine is equipped with stainless steel, attractive and durable. • The position if the air nozzle could be adjusted depends in the bottle shapes. • There are tunnels of 1m, 2m and 3m which could be choose from. • The width and height of the steam pipe is adjustable by the shrink position. The machine is made of stainless steel, coated design features good looking. Patent label driven and shooting roller system, performs accurate label cutting. Adopt imported servo motor which increases the stability and durability. Patent blade cutter design, smooth cutting, easy to replace. Advanced Human-machine interface, featuring user-friendly operation. Modular structure design; easy to operate and change for different shaped bottles. Adapt to shrink film thickness from 0.035~0.08mm. Diameter if bottle: 25~155mm is applicable. The exist system is available to shrink label height under 300mm. Applicable to PVC, OPS, PET and PLA shrink films.